Key Fund, a long-standing investor in community and social enterprises, is delivering the Northern Impact Fund, aimed at new and early stage enterprises who are seeking finance to support growth. A new blended grant and loan fund, the Key Fund package looks to secure sector deals in the £5,000 to £150,000 range. Applications are accepted from across the North and Midlands, with the Fund looking to realise 46 deals a year. At a flat rate of 6.5% interest, the average loan term secured is expected to be three years. A new magazine, Think Enterprise, from the IOEE. ‘The Institute of Enterprise and Entrepreneurs has been over 15 years in the making and exists to make sure that all those involved in enterprise are able to access the support they need, when they need it’. Whether your interest lies in tracking SFEDI Centres of Excellence or in developing apprenticeships and wider learning in business, then Think Enterprise has something of interest for you. Be sure to check out pages 16 & 17, with their 2016 Enterprise Awards almost upon us, if only to read of the developmental success of others can in itself an inspiring and confidence building thing as you grow your own business, whatever sector you are in. You can find the IOEE on-line here. Starting your new social business in 2016? Planning your new social enterprise in 2016? The Key Fund have a range of on-line resources available for the budding social entrepreneur, or social enterprise that is leaning towards developing its business in 2016. You can find some simple and effective Key Fund toolkits below. Whether needing to survey and assess your income needs as an individual, or a family unit, or to calculate various loan interests. You can also find a template for creating your Social Enterprise Business Plan. This will guide you methodically and clearly through the steps you need to plan your governance, your policies and your operational delivery – all focused on social enterprise creation and sustainability. View, print or download your cashflow template here (MS Excel file). View, print or download your Business Plan template here (pdf file). View, print or download your Loan Illustrator here (MS Excel file). View, print or download your personal survival budget template here (MS Docx file). The Key Fund main web pages also have a more comprehensive and detailed set of resources available on the Fund Start-up Advice web centre (Courtesy of Start-up Donut). This offers you more insight and detailed resources for creating a new social business and has links to a variety of services and information that new groups or companies will find useful. So, wherever you are on your social business journey in 2016, from first idea to seeking social investment, you can contact The Key Fund Team here. A happy and enterprising 2016! As part of the Hogeschool van Amsterdam, Amsterdam University of Applied Sciences – the Institute of Network Cultures have recently published another document in their innovative and ground breaking research and thought leadership programme. The MoneyLab Reader – An intervention in Digital Economy, edited by Geert Lovink, Nathaniel Tkacz and Patricia de Vries, contains much that mainstream financiers may find provocative, but which takes positions which offer interesting new insights into the emerging digital economy. View, print or download a copy of the book here. This published work contains sections on new digital-economic forms, some subtle essays on how value can be driven and extracted from an open source, ‘Commons‘ based economy, as well as essays on Bitcoin and other complimentary currencies. There is a strong section on the ‘Economies of the Imagination‘. This is mindful of one of the driving forces of the digital economy, which is the creation of art and artistic output through new mediums of distribution and payment. Readers in the creative quarters across our region may find this section particularly energising. ‘MoneyLab, a network of artists, activists and researchers, founded in 2013 by the Amsterdam-based Institute of Network Cultures; its aim is to research, discuss, and experiment with (alternative) internet-related revenue models in the arts and beyond’. In a powerful essay, The Long Game by Keith Hart, there is a telling argument that Georg Simmel’s prophesy of the withering of the physical substance of money and the emergence of revolutionary new social institutions supporting new, fiscally adroit communities of interest may already be upon us. (The Philosophy of Money: 1907). Whilst this may not be new to mainstream bankers, the shift in fiscal power from lender to borrower, which this implies, will be a difficult concept for many. However, in the newly emergent social finance sector we can see that new paradigms of fiscal effectiveness, lending tolerance and social outcome entwined in community values, are all currently abroad. We commend this lengthy pamphlet to our readers…perhaps we are all living in a ‘Simmelcast’ world now? 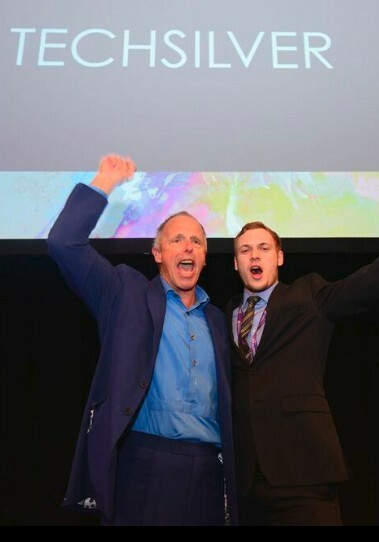 Nottingham’s Miles Waghorn has emerged the triumphant winner of the SEEM ‘New Business Idea’ Award at the inaugural Venturefest East Midlands with his innovative TechSilver e-commerce store. Over 1000 delegates gathered at the East Midlands Conference Centre in Nottingham for Venturefest. A mix of entrepreneurs, business owners, academics, business services and representatives of large multinationals joined together to grow the East Midlands’ innovation eco-system. Miles, a 22 year old social entrepreneur, secured the coveted SEEM award for his business idea that provides solutions for seniors. TechSilver, a ‘technology store for the later lifestyle’, provides innovative products and supportive services, designed, created or adapted for senior users ensuring they make the most of their purchases. Based on feedback he received from ‘senior’ customers whilst working in the technology department of a major UK supermarket store, Miles decided to make this idea a reality. Six months after completing the ‘HeadStart’ entrepreneurial programme at The Hive, Nottingham Trent University’s business incubation facility, TechSilver was born. Roger Moors, CEO of SEEM said he was delighted that Miles had won the award adding that many senior members of society would now benefit from this support and be able to access technology that they may feel is a little intimidating at times. Recruiting for the Elvaston Castle board…. ‘…we’ve recently appointed a Chair of an advisory ‘Development Board’ for Elvaston Castle, and are now looking to recruit other Board members who can bring a range of expertise to bear including business planning and finance, fundraising, built and cultural heritage, and partnership working. The historic gardens and buildings of the estate, situated between Derby and Nottingham, are in need of investment, sound strategic management of a new future, all combined with a sensitivity and acknowledgement to the work of preservation and community engagement that has gone before. You can view, print and download a copy of the Role Profile and Terms of Engagement for the Board posts here. The lounge of Antenna, in Nottingham, was buzzing last night (24th February) with talk about business for good and how change in traditional structures and processes can create models of delivery that are good for business. The event was part of the ongoing programme of engagement with post-grad students at Nottingham University for the Social Business Programme, which seeks to offer opportunities and ideas for the current post-graduate cohort of the University to start a business for good, a Building Enterprise activity. You can find more about the work of the project on our events page, or see the Nottingham City Postgraduate Social Business Programme on-line here. Corporate social responsibility is dead, long live Social Business! This could have been the rallying cry for the audience from Paul’s presentation. The old ways are perhaps no longer fit for purpose, we were told. With CSR as a concept, arguably, seen as a reactive and backward looking process. Much was made of nature and things natural as metaphors for new business development under the banner of Social Business. We have destroyed 50% of the rain-forest so far. Paul surprised the audience with the metaphoric concept of bio-mimicry as perhaps providing the new, forward looking business model. However, the speaker argued, not all in the past is of no use. The Guilds were, from early modern history, craft makers and carers for community. Fostering skills and market development, from their geographical locus, yet preserving the best of tradition. It is this, the fostering of ideas, like the emergent Social Business movement, that is the only truly scaleable resource we have. ‘A dialogue between two people with ideas results in a more dynamic third idea‘. Wonderful stuff! This section of the evening had the style of a structured interview and response between Toni and Jeanne. Toni, in her development of the Nottingham Circle, a membership group for the over-50’s, had clearly done much to encourage the recording and shaping of data and soft outcome records for her organisation. In any new or developing business, this collection of data is redundant in itself. It is how the people in the organisation deploy the knowledge locked up in the data, or in people’s stories over time. Relationships, shared goals, resourcefulness and generosity. These were some of the keywords Jeanne was able to elicit from the speaker. They are the perfect framing paradigm for a good Social Business too. These and a great spreadsheet, which you can deploy for funders, partners and beneficiaries too. How do you finance good business was Roger’s key question to the audience at Antenna? Illustrating the tensions between the Third Sector and traditional business, Roger opined that it was seen as the sector’s traditional role, over business, to deliver social outputs. This has changed. Using another natural metaphor the audience were asked to declare if they ate vegetables? Then they were asked if they were vegetarians? There was a large disparity in the aggregate numbers of the replies. Thus, Roger argued, ‘…Social Business is not about legal structure, it is about how you do it’. All businesses need capital, to finance cash-flow, purchase of assets or to develop their business idea. Social investment is, therefore, about investing for impact. There are, therefore, three key elements to getting an offer of social investment. An economically sustainable idea. A collection of ‘investable’ people. Impact. To see if you qualify, contact Roger at SEEM. He’s the capital chap! Martin works with people in organisations to ‘...identify, articulate and present the truth of their product or service’. Echoing the message that traditional business methodologies were undergoing change, Martin stresses the search for ‘truth’ in presentation, marketing and delivery as now being the key social business driver. There is a new commercial imperative. It is the power of the story, not about a thing in itself. As founders of new social businesses the message about your motives, your values and the journey you have undertaken to get here are now powerful drivers of client or customer engagement. This was a telling section of the evening. Stressing the emotional and empathetic engagement inherent in social business. ‘People no longer buy the ‘what’, they are interested in the ‘why’. Nicky’s story is one of developing her Social Business through reaction to familial allergies and intolerances. Driven to engage with school catering staff, Nicky was able to grapple initially with the ‘different school lunch’ issue, helping to foster a more tolerant attitude to difference, certainly, but also restoring a sense of balance and good health to her own family members. From this ‘community action’ approach, Food Freedom has gone on to foster and deliver a range of training courses and awareness raising expertise for a variety of clients – schools, companies and community settings. Make sure you gather that evidence formally and then deploy it wisely. The evening concluded, after a short break, with a full Q & A session with the expert panel. The Chair was able to guide the audience through questions and responses, from theory and practice, to help them conceptualise, form or grow their Social Business idea. This was a well organised, useful and informative session. It is part of a wider programme of creating enterprise events. If you have an idea as post-grad, then this is the place to go for answers, advice and, perhaps, even funding…see more here. Calling all Nottingham City Post-grads, are you ‘Social Business’ minded? Sharing knowledge, developing a good idea and planning ahead? If you are on a post-graduate course in Nottingham, in any discipline, and interested in starting your own business, then the Social Business Programme represents a great opportunity to develop your idea, share opportunities and to learn about the social business start-up sector. The Building Enterprise Project is managed by Community Partnerships at the University of Nottingham. Led by Roger Moors, CEO of SEEM and Jeanne Booth FRSA, founder of The Good Work Guide. From February to April 2015 the programme of events and conferences represent a great opportunity to develop your ideas in concert with a team Social Business specialists. You can also meet us at a special postgraduate meeting of First Tuesday, Nottingham’s network for social businesses, on February 3rd, 2015. Social Business and social impact measures are part of the debate. Places are free, but numbers are limited. 24th February, 2015 – What is good for business? Four different speakers offering you insights into key aspects of Social Business development. A Question and Answer Session will follow this, the first of four sessions in the programme. There is more to come in March and April. Elvaston Castle and Country Park, in Derbyshire, has been working to establish through consultation, with a wide variety of communities of interest and partners, a clear ‘vision document’ for the Castle. This has been achieved and now the Castle is looking to appoint a Chair of a new advisory Development Board, to prepare the estate for the next phase of its sustainable future. Working with The National Trust, Derbyshire County Council have delivered a profile and terms of reference for the new Chair and the Development Board. You can see the original recruitment documents on the web pages of Everything Elvaston Castle here. This Community Interest Company (CIC) has been established to play its own partnership role in developing and broadcasting news and information to the Elvaston community and its hinterland. (Roger Moors of SEEM, has through his work with the community and DCC, as well as the Elvaston team, been instrumental in the creation of this new inclusive community presence, designed to inform everyone about the new future for the Elvaston Estate). You can discover more about ‘The Future of Elvaston’ on the web site www.futureelvaston.co.uk here.